When planning a holiday, especially to a beachfront location, you hope that there will be only sunny, beautiful days. With Byron Bay as your destination, it’s a pretty good bet since most months average 10 days or less of rain, and even during the rainy season, it might only rain in the evening. However, if you do happen to catch one of the wet days, don’t let it rain on your parade, rest assured there are plenty of Byron Bay activities to enjoy during gloomy outdoor conditions. We’ve rounded up a list of things to do in Byron Bay when the weather doesn’t cooperate that are still sure to make your holiday fun. We even included family-friendly options in addition to ones that might only appeal to adults. When looking for ways to keep your kids entertained during a rainy period on your Byron Bay holiday, one of the most highly recommended things to do in Byron Bay is Circus Arts. Between the indoor climbing wall and the play space, there is something for all ages of kids. If you happen to be in Byron Bay during the school holidays, you can sign up for a half day or full day of rainy day fun for your kids. These workshops include tight wire, mini trampoline, tumbling and much more—even a ride on the high trapeze! Children must be at least 5 years old to participate. Half days run $40 while a full day is $70. When looking for Byron Bay activities to do on a rainy day if you are on holiday with the family, Kids World, located at Shed 5, 17 Brigantine St., just might do the trick. The indoor kids’ play area caters to kids 11 years old and under. It features a climbing structure, an adventure castle and a safari ride as well as an area just for toddlers. There’s even a café for the adults to hang out at while the kids play. The kids will need to wear socks. It is closed on Mondays—except on school holidays and, get this, rainy days! Admission is $10.50 per child and the centre is open 9:30 am to 2:30 pm on weekdays and until 5 pm on weekends. While lawn bowling is featured in Byron Bay’s town centre, you can head to Ballina Tenpin Bowl for an indoor bowling experience—a great idea for the whole family when looking for things to do in Byron Bay on a rainy day. Open weekdays at 9 am and on weekends at 10 am, you can play one game (including shoe hire) for $12 or two for $18. If you nab the online coupon, you can play two games for $14. The bowling alley even offers glow in the dark bowling on most weekends from noon to 4 pm and most weekday evenings (every day during school holidays). A go-to activity on a rainy day is a movie, and you’ll find yourself with options for your movie-going experience in Byron Bay. Head to the Palace Cinemas for a traditional experience—here you’ll find anything from the big blockbuster films to some of the smaller, independent films. Located on Jonson Street in the heart of the main drag in Byron Bay, Palace Cinemas provides a full spectrum of drinks and snacks, including a licensed wine and beer bar. Experienced baristas also serve up Lavazza coffee and espressos. Tickets cost $18 per adult and $13 per child, unless you happen to come on Bargain Tuesday where tickets are $10.50 for adults and $10 for children. If you desire a more arthouse movie setting, then head over to Pighouse Flicks Lounge Cinema where you’ll find lounge seating and even a row “lay down” seating with upgraded audiovisual equipment to give viewers a first-rate showing. The theatre seats about 90. Tickets for movies cost between $10 and $14, depending on what category you fall in (adult, student, senior). There is a snack bar for all your movie snacking needs or if you go to a movie and then hold off on food, you could always head to the Byron Bay Brewery (also called the Buddha Bar) located along with Pighouse in the Old Piggery on Skinners Shoot Road. Depending on who is going—you, you and your partner, your family or any other combination—will determine the best place to head for shopping when the Byron Bay weather forecast turns dreary. The town centre of Byron Bay, Jonson and Fletcher Streets in particular, play host to many cool, distinctive shops offering up everything from clothing to home wares to jewellery. If you are looking for more artsy, local wares then head over to the Arts and Industry Estate where you’ll be able to view work from glass blowers to soap and candle makers. Check out our blog posts on more shopping ideas as well as information on shopping excursions less than an hour from Byron Bay. If you are in search of a more traditional shopping centre, then you can head out to Ballina Fair Shopping Centre, located about 25 minutes from Byron Bay. You’ll find lots of stores for any shopping need you might want to fill from men’s and women’s fashion to books and music. Among the Byron Bay activities for a rainy day, heading to a spa for a massage or some other treatment might be the most relaxing. A relaxing massage is a good rainy day Byron Bay activity. Try out Buddha Gardens Day Spa off Skinners Shoot Road, for anything from deep tissue massages and bamboo massages, to facials and body scrubs to even just a simple but luxurious pedicure and manicure. Couples who visit here can enjoy treatments together in The Orchid Room. Another option is The Spa at the Byron at Byron Resort that provides a full range of day spa treatments, even including some wellness packages and ‘enhancements’, such as lip, eye and scalp. Of course, there are also several spa packages available as well as couple treatments. If you find yourself on holiday with a rainy morning and looking for things to do in Byron Bay, call Irena and see if you can book an art lesson at the Byron Bay Art Studio. During a three-hour morning lesson, you’ll be able to make a painting to take home as a souvenir of your holiday in Byron Bay. The unique technique that Irena employs helps even a person who has absolutely no art experience to create a masterpiece. For $50, you’ll get all the materials supplied and even morning tea. At the end of the class, paintings are rolled up so they are easily taken home. To sign up, call Irene at 0400 409 3919 or email her at irenais@bigpond.com. If you happen to be a foodie on holiday, then this option of Byron Bay activities will be right up your alley to enjoy a rainy day. On Mondays and Wednesdays, Taste Byron Bay offers a cooking class at the Figtree Restaurant in Ewingsdale. The classes take place from 10 am to 1:30 pm and cost $150 per person. Class participants will get most of their ingredients from the garden at the restaurant and add in local meat and/or seafood to start the cooking process. No matter what your skill level is, the teachers of the class will help you make delicious food. Plus, you’ll have the chance to talk with chef Terase Davidson. At the end of class the whole class sits down to enjoy the fruits of your labor paired with a glass of wine or locally brewed beer. Go the website to book online for the class. Byron Bay is considered a top location to take yoga in Australia, so why not use the rainy conditions to try out one of these excellent yoga classes? We suggest trying out Byron Yoga Centre created by John Ogilivie, considered a top Australia yoga instructor, as a first option. Byron Bay is a yoga hotspot. With two locations, you can have your pick of what fits with your schedule. At the Byron Street location, holiday visitors may join a class for $18 with choices from 8 am to 6pm. Each class, all of which are suitable for all levels including beginners, runs for 90 minutes. At the Purna Centre, there are options for the hour of power (7 – 8am) three times a week for $15, or for $10 take one of the 90 minute teacher trainee classes offered everyday at 4 pm or most mornings at 6 am. 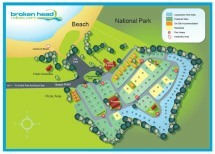 Close to your Byron Bay accommodations at Broken Head Holiday Park, you’ll find Flo Fenton’s Intouch Yoga. Two 90-minute classes are offered (5 pm Tuesday and Thursday) for $16 per class and a two-hour class on Saturdays at 10 am ($18) at the Suffolk Park Community Hall. Check out our post on yoga classes in Byron Bay to find lots of other options. A rainy day on a holiday provides the perfect excuse to kick back and make it a relaxing day. Perhaps you could take a long coffee break or combine it with a brunch while you wait out the rain. There are many coffee shops in the Byron Bay area to get your caffeine fix. Check out our blog post on the best coffee shops in Byron Bay. Also don’t forget a rainy morning is a great reason to draw out breakfast and sip on your second (or third …) cup of coffee. We offer up recommendations here. Just because it’s raining doesn’t mean you can’t enjoy the beach—you just might want to do it indoors. Why not grab a meal at one of the beachfront restaurants and watch the waves roll in while you nosh on good food? Pick from any of the Byron Bay restaurants with great beach views, like Fishheads, Byron Beach Café, Italian at the Pacific or Rae’s Fish Café. Rain or shine, a holiday in Byron Bay is going to be an excellent choice for you and friends or family. There is so much to do in any condition—and don’t worry, we’re guessing that you’ll have plenty of sunshine—that you will be able to make wonderful holiday memories no matter what. Consider booking your holiday stay at Broken Head Holiday Park where our accommodation options will give you a variety of affordable options and allow you to spend more travel budget on the fun Byron Bay activities.